"A commitment to pay it forward"
What is ESCS ULTRA Satisfaction Guaranteed? ESCS is a franchised distributor for select manufacturers who have committed to partner with us to provide the most relevant information on their products from the communities you trust, empowering you make informed buying decisions. ESCS ULTRA may include pictures, descriptions, data sheets, & content that discusses applications by market sector or to a mil-spec. Stories discussing processes, press releases, or testimonials may be hyper linked. You digg? If you're Linkedin? Tweeting, watch YouTube, Blog, or maybe just plain StumbleUpon our site we're sure you will not only Like us on Facebook, but also find our content delicious. If other OEM manufacturers offered this, how would that benefit you? Manufacturers wishing to provide this type of value added service contact - ESCS marketing. What is ESCS QRnGO.info ? 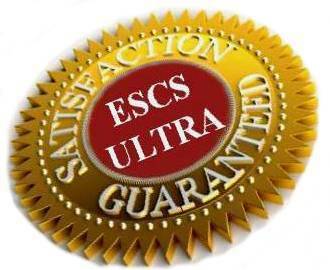 It's a class of service we call "ESCS ULTRA Satisfaction Guaranteed". Click the logos to check out what "New Product Releases" are offered by our ULTRA Suppliers.